Franklin junior goalie Gianna Cameron has been a standout for each of her two seasons in net for the Panthers, earning HockomockSports.com First Team honors both years. Cameron, a University of Oregon-commit, has been a rock for the league’s top defensive unit, showing off quick hands and the ability to read the intentions of opposing attackers. She led the league in goals against average with just a little more than six per game. The Panthers only allowed 127 goals last spring, which was almost 30 goals fewer than the second-best defense in the Hock, on their way to another perfect league campaign, another Kelley-Rex division title, and another trip to the D1 East semifinal. Cameron has that knack for making the big saves in big moments and will be a key figure if Franklin wants to regain its sectional title. It is hard to find new plaudits for the two-time reigning Hockomock League MVP, 2017 HockomockSports.com Underclassman of the Year and 2018 HockomockSports.com Player of the Year. 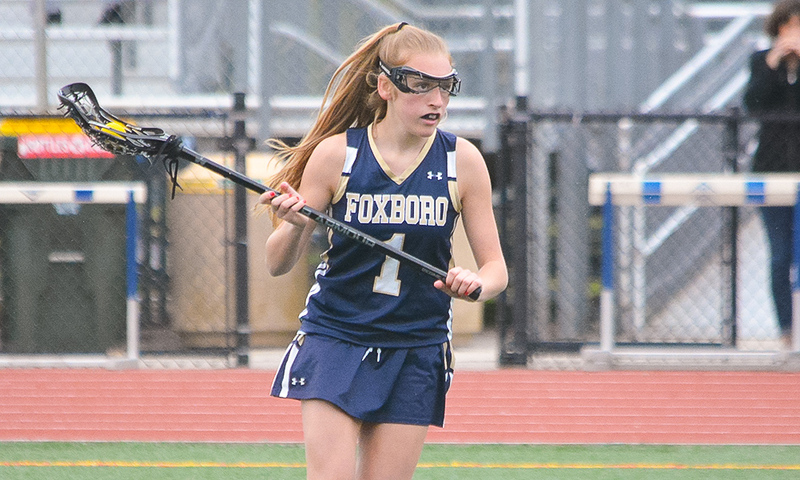 Foxboro senior midfielder Sophia DiCenso has been one of the league’s top players since she walked onto the field her freshman year and the University of Richmond-commit is the main reason that the Warriors are considered one of the favorites in D2 East. She scored 56 goals and assisted on 27 others last season, helping the Davenport champions lead the league with 274 goals as a team. She also added 53 draw controls, showing off the all-around game that got her onto the national team radar. With her quick feet, quick hands, and vision, DiCenso can open up defenses for either her own shot or to set up her teammates and she rarely makes the wrong choice when through on goal. Sharon senior midfielder Emma Eberhardt displayed the full range of her game last season, leading the league in scoring and helping the Eagles make another trip to the postseason. Tall and athletic, Eberhardt has the ability to carry the ball the length of the field, split the opposition defense, and use her long reach and quick shot to score from any angle. The Lehigh University-commit scored 69 goals and dished out 56 assists in 2018 while grabbing 116 draw controls and scooping up 56 ground balls. She was a do-everything midfielder last season and might need to do even more this year with the graduation of her midfield partner Sabrina Robbins. If she can develop her relationship with promising sophomore Jenna Goldstein, then the Eagles will continue to have one of the most dynamic pairings in the league and challenge Foxboro’s hegemony in the division. Mansfield senior attacker Katy Garvin was not only the Hornets’ top attacking threat in 2018 but led the Hockomock League in the regular season with 70 goals, including the 100th of her career. Coming into the new season, under new head coach Lauryn Wilkie, Garvin will be the focal point of the Mansfield attack. A quick player with the ability to shake off defenders with a drop of the shoulder and then finish in traffic, Garvin also had 40 assists and her 110 points accounted for nearly half of the goals that the Hornets scored last spring. Entering her fourth year on varsity, Garvin will be counted on to try and push Mansfield up the standings and get the Hornets back into the state tournament. King Philip senior Caroline Klim stepped up in a big way last season after an injury to Katie Crowther, who had led the Warriors in scoring for three seasons, went down with an injury. Klim, a UMass Lowell-commit, propelled KP into second place in the Kelley-Rex, including a three-overtime game against Franklin that nearly ended the Panthers’ long league winning streak, and into the D1 East quarterfinal. She scored 73 goals (counting the playoffs), which was the best in the league, and had 12 assists. In addition to her scoring, Klim grabbed 80 draw controls and 40 ground balls. Her tenacity and creativity in front of goal made her one of the toughest covers in the Hock and she came through in big moments, such as a nine-goal haul against Sharon in the playoffs. With Klim leading the line, KP is thinking about ending the long dominance of Franklin in the Kelley-Rex division. North Attleboro junior Katie Lindstrom broke out last spring, proving to be a great complement to Mackenzie Rosenberg in the North midfield and getting the Rocketeers within one league win of a return to the state tournament. Speedy and with a strong lacrosse IQ, the UMass Lowell-commit eclipsed the 100-point mark for her career as just a sophomore, scoring 43 goals and recording 21 assists for the season. Her playmaking ability, whether to open up space for her own shot or to set up teammates in good scoring positions, will be vital for the Rocketeers as they try to make a run back to the postseason and challenge Foxboro at the top of the division under second-year coach Colleen Carchedi. Attleboro senior midfielder Kyra Lyons is one of the players that flies under the radar, as the Bombardiers struggled to pick up wins last year despite Lyons having a great individual season. A HockomockSports.com Second Team performer last season, the Framingham State-commit was one of the top 10 scorers in the league last year regardless of the attention that opposing defenses were forced to give her. Lyons uses her speed and her ability to find small seams to create scoring opportunities. She scored 54 goals as a junior and assisted on 14 others, which accounted for more than half of the goals that Attleboro scored as a team. She was also the first player in program history to reach the 100-goal mark for her career. Under first-year coach Chrissy Quinn, Lyons will again be the primary weapon for Attleboro as it tries to improve on its record in 2018. Oliver Ames senior Olivia Piazza is another player that has had a strong career outside of the league’s perennial powers and she has gotten the Tigers on the verge of a playoff spot in each of the past two seasons. She is an all-around performer for OA, scoring goals, setting up teammates, providing defensive cover, and being a main weapon in the Tigers’ transition game. Piazza, a Merrimack College-commit, was third in the league during the regular season with 91 points, scoring 50 goals (including the 100th of her career) and assisting on 41 more. She also had 106 draw controls, 35 ground balls, and caused 32 turnovers, providing OA with just about whatever it needed every game. If the Tigers will make a run at the state tournament this season, Piazza will be right in the middle of everything again this spring. Taunton sophomore midfielder Alana Tavares is already a seasoned veteran for the Tigers as she enters her third year on varsity. Already a 100-goal scorer in her career, Tavares has emerged as one of the league’s top attacking threats, despite garnering the attention of every defender that the Tigers face. She was one of the top 10 scorers in the Hockomock during the regular season with 53 goals (tied for eighth best in the Hock) and 21 assists (tied for ninth best) and has been the player that the Taunton offense runs through since she jumped onto varsity. Her stick skills, speed, and her ability to see the openings in a packed defense have allowed her to make an instant impact on the league and her improvement every year gives a young Taunton program the potential for pulling a surprise every game. Franklin has dominated the Hockomock League for the past seven years, having not lost in 71 straight league games dating back to 2012, and the Walsh sisters have been a primary reason why the Panthers have continued that run in the past few seasons. Annie, a senior midfielder, and Erin, a junior, are both Boston College commits and have both been named HockomockSports.com Underclassman of the Year (Annie in 2017 and Erin last year). Annie has been the quarterback of the Panthers’ offense, setting things up, and getting the Panthers into the right spots. She scored 56 goals and had 15 assists last year and is an all-around threat with her ability on the defensive side of the ball and on draws. Erin is one of the league’s most creative finishers, pulling off highlight-reel shots even in the biggest moments. She was sixth in the league in scoring during the regular season with 77 points in 2018, scoring 53 goals and dishing out 24 assists. Playing against one of the state’s most difficult schedules, the Walsh sisters have continued to put up big statistics and will be key to Franklin’s run at another D1 East title this spring.